Everything Scrapbook & Stamps has Dina Wakley’s new book in stock and we have to say it is pretty fabulous.. . so just like Dina has her thumb up in the photo, Everything Scrapbook & Stamps gives this book a serious thumbs up. 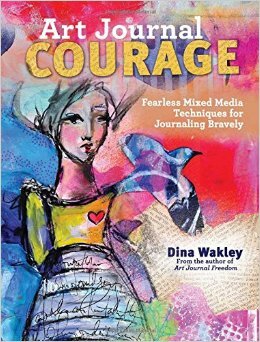 Art Journal Courage – Eight chapters full of prompts, step by step, techniques which are followed by luscious art work. Dina even shows you that you can draw. Discover the techniques and courage you need to journal bravely! With Dina’s help, you’ll begin by working through any fears you have of using your own handwriting. You’ll get journaling prompts and techniques to help you develop a handwriting style you’ll love and words you’ll want to write! Then, you’ll move onto drawing: you’ll learn not only how to train your hand, but also how to appreciate your own unique drawing ability. As you continue through the eight chapters, you will learn additional mixed-media techniques to help you overcome your fears of new materials, using photos of yourself, creating layers, working without a plan and much more. Put your worries aside and create fearlessly! For those of you who would like a copy we do have them in stock and we can ship them for $5.75 priority mail. Click this button to be taken to our paypal account and we will get one in the mail to you toot suite!